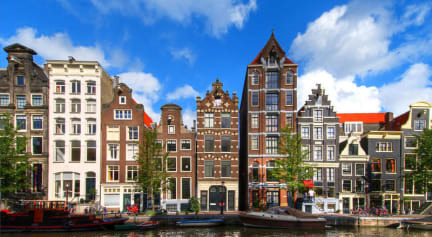 Townhouse Hotel i Amsterdam, Nederland: Bestill nå! The Townhouse Hotel, is a typical small monumental canal house located right in the heart of the central canal district of Amsterdam, the hotels superb location offers very easy access to all the citys attractions, while surrounded by tree-lined canals and small cobblestone streets for those romantic walks. The Townhouse Hotel building dated back to 1689. The hotel offers rooms with views over the canal, upon availability, comfortable beds and a warm atmosphere. We have rooms with private shower and shared shower. The room(s) you book could also be in our other building across the street!!! Other facilities in each room are a sink, coffee and tea facilities, safety box, Cable TV, Hairdryer. ALL THE ROOMS HAVE SHARING TOILETS, which are cleaned many times a day. The Hotel provides FREE INTERNET connection. 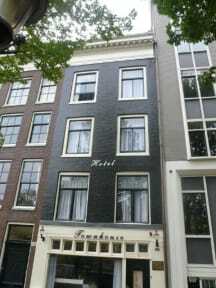 The hotel does not serve breakfast, but around the corner in the Utrechtsestraat there you will find many breakfast restaurants. There is no elevator. We want to provide our guests with a comfortable, safe and unforgettable stay, we hope you will feel at home. - 5% city tax is not including the room rate. - The reception is open till 23.00. please let us know your arrival time! - Please notice that the Hotel will pre-authorize creditcard 7 days prior to arrival.